"I can drive the ball 25-35 yards farther in my golf game, and play 18 holes without getting stiff. "Since I've started Pilates, I dropped 2 dress sizes, lost inches around my waist, hips. Firmed my legs, arms, and feel more energetic thru out the day." "I love Pilates! I had been with a personal trainer for several years with no major results because it was easy to slack off. With Pilates I feel it every time. Charles has helped me become stronger, leaner and motivated. Pilates will be a life long activity for me because I see and feel progress with each session." 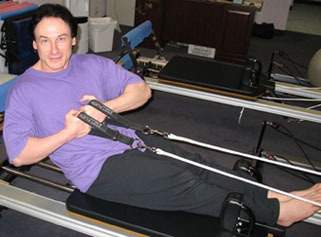 Pilates Advantage Studio is owned by Charles Vesely, Instructor/Certified Personal Trainer. Private and semi-private sessions are available in our Omaha Studio. Our fully equipped Pilates studio features the very best in equipment in a comfortable and private setting. Pilates is a form of exercises that develops core (abdominal, lower back area, hip area) strength and flexibility. People will notice improvements in posture, flexibility, energy, core strength, balance, stamina and muscle tone. Joseph Pilates developed therapeutic exercises to help dancers recover from injuries and improve their performance. Pilates is considered the most effective form of rehabilitation from injuries and is highly recommended by medical specialists. Many athletes and actors have turned to pilates for optimal fitness as well. Now you can experience what dancers and athletes rave about the reformer and fit ball. "Physical fitness is the first requisite of happiness. Our interpretation of physical fitness is the attainment and maintenance and satisfactorily performing as many and varied daily tasks with spontaneous zest and pleasure." Everyone dreams of having a good looking body. Your answer to developing one lies within the Pilates Method. Experience what dancers, actors and athletes rave about.